In the last installment of “Four Pack of Fear,” we talked a little about Japan’s Shochiku Studios and their horror-sci-fi hybrids of the late 1960s. Genocide is a continuation of this tradition, while The Living Skeleton is not. Without further ado, let’s get right down to these disgusting morsels. Also known as War of the Insects, Genocide takes the morbidity of Goke, Body Snatcher from Hell and cranks it up to eleven and two-thirds. Also, while Goke, Body Snatcher from Hell is fatalistic and pessimistic about humanity’s ability to learn to live with peace, Genocide is simply nihilistic. Directed by Kazui Nihonmatsu, Genocide saw its initial release during the turbulent year of 1968. A good bit of Cold War liberalism seeps into this film, and yet it’s still thoroughly Japanese. This is because Japan, as the first country to taste atomic radiation, is particularly touchy about the issue of nuclear destruction. A hydrogen bomb plays a pivotal role in Genocide, and as such, the film’s consciousness, Dr. Yoshito Nagumo (played by Keisuke Sonoi), must provide the perfunctory warnings about annihilation and the futility of war. Genocide opens with a rather odd scene. 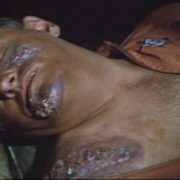 While serving onboard a U.S. Air Force bomber traveling to a secret U.S. air base in southern Japan, Charly (played by Chico Roland) has a mental breakdown after hearing the buzzing of an insect. In the midst of his PTSD delirium, Charly accidentally releases a hydrogen bomb somewhere over Japan. At the same time, a huge swarm of insects coat the plane and cause a massive explosion in the wings. The small crew is forced to parachute to safety. Ultimately, the three American airmen wind up in a cave crowded with super vicious insects. Only Charly survives. Elsewhere on the island, an investigation begins after the police find Charly’s badly injured, yet still warm body. Joji Akiyama (played by Yusuke Kawazu) is the only local who saw the crash, but he’s got a problem. Joji, a bug collector who provides samples to Dr. Nagumo, saw the plane’s crash landing while in the arms of Annabelle (Kathy Horan), his blonde mistress. When word leaks out from the Hotel Bougen, which is where Joji’s wife Yukari (Emi Shindo) works, that Joji and Annabelle are an item, the Japanese police put the squeeze on Joji. To make matters worse, Joji learns that Yukari is pregnant with their child. The Japanese police are not all Joji must contend with. An American detail led by Lieutenant Colonel Gordon (played by Ralph Jesser) will stop at nothing to retrieve the bomb that Charly accidentally deployed. In Genocide, the upper echelon of the U.S. military is presented as cold, utilitarian, and thoroughly unconcerned with anything other than winning the Cold War. Dr. Nagumo frequently admonishes Lt. Col. Gordon for his single-mindedness. However, as events unfold, some of the American suspicions are proven right. The island contains a small cell of Communist spies, one of which is Annabelle. However, Annabelle is not interested in the dictatorship of proletariat, nor is she dedicated to carrying out the whims of Moscow or Beijing. Annabelle, a survivor of the Nazi concentration camps, simply wants to punish humanity. Her way of doing this is ingeniously cruel—she attacks her victims with mind-altering insects that plant eggs in their host’s bodies. Poor Charly succumbs to Annabelle’s monsters, but before he dies, he warns of the coming genocide. It seems that Annabelle seeks the H bomb too, but she plans to wipe out all of the world. As the race for the H bomb reaches its climax, Annabelle’s mutant insects are released. Although Dr. Nagumo has developed a serum to combat the insects, there’s not enough of it to save everyone. Lt. Col. Gordon makes a very brutal decision while flying high above the island—save the serum for his men and detonate the H bomb via remote control. Killing the insects and destroying the bomb before the Soviets or Chinese can find it is worth a few million casualties, Lt. Col. Gordon asserts. Dr. Nagumo is not willing to let this happen, nor is an unnamed, but well-armed co-pilot. A few shots ring out, then a bright flash lights up the sky. Genocide is Shochiku’s most political horror/sci-fi work of the 1960s. The film explicitly touches upon the major concerns of the era, from nuclear warfare to environmental destruction. It could’ve been a preachy movie, but Genocide is able enough (and zany enough) to remain a thrilling potboiler. Like the best Shochiku films of the 1960s, Genocide feels like live-action anime, a fact that may stem from cowriter Susumu Takaku, a veteran of that genre. The anime-ness of Genocide is present in The Living Skeleton, but it is balanced by the film’s gothic quality. 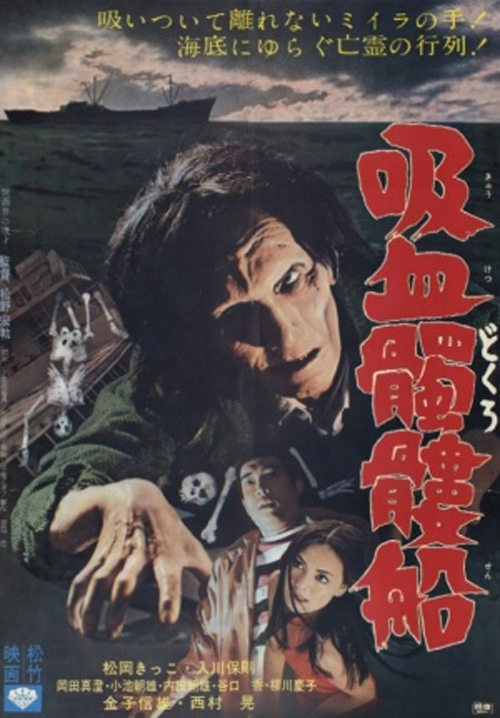 Co-written by Kyuzo Kobayashi, who also co-wrote Goke, Body Snatcher from Hell alongside Takaku, and directed by Hiroshi Matsuno, The Living Skeleton immediately stands out from the corpus of Shochiku horror because it was shot in black and white. Although the film also contains the same mad science and conspiracy elements that checker Genocide, Goke, Body Snatcher from Hell, and The X From Outer Space, The Living Skeleton is predominately a ghost story. The film opens onboard the Dragon King, a merchant vessel under the control of a gang of ruthless pirates. The gang’s leader is a stereotypical villain with a bald head and badly wounded face. He and his men kill off the ship’s crew with submachine gun bullets. Then, after taking the ship’s gold, the pirates let the ship drift aimlessly in the ocean. Among the dead are Yoriko (played by the beautiful Kikko Matsouka) and her husband, a celebrated scientist. Three years after this heinous crime, the Dragon King is spotted from the coast. In the nearby seaside town, Yoriko’s twin sister Saeko (also played by Matsouka) lives with a kindly Catholic priest (played by Masumi Okada). Saeko’s fiancee, Mochizuki (played by Yasunori Irikawa), hears the ghostly foghorn and tells Saeko about what he’s seen and heard. Although frightened because of what happened to her sister, Saeko and Mochizuki visit the ship one night. The trip leaves both frightened, and yet Saeko appears far more sullen and reserved than usual. It is at this point that the pirates responsible for the massacre onboard the Dragon King are killed off one by one. As fantastic as it seems, Mochizuki and Father Akashi believe that Saeko is possessed by the angry spirit of Yoriko. It is Yoriko, through the living body of Saeko, who is killing the former pirates, or so it seems. Father Akashi concerns himself with the mystery not because he has cared for Saeko for three years, but because Father Akashi is actually the scarred ringleader of the pirates. Near the film’s climax, after Akashi strangles Saeko, he is drawn back to the Dragon King. There he is shadowed by the still living Saeko. Eventually, in the ship’s dank hull, Akashi finds Yoriko’s body and the zombified remains of her husband. The man not only survived the pirate murders, but he has managed to stay alive by eating the flesh of his victims. He has also kept Yoriko’s corpse beautiful through daily injections of his own blood. Most sickening of all, the pale, skeletal man has maintained his marriage bed nightly while listening to the recorded moans of his dead wife. Such perversity cannot live. So, the living skeleton of the title is dispatched. Then, after being struck with a large quantity of acid, Akashi dies too. The final death, Saeko’s, is voluntary. She refuses to flee the acid-filled ship with Mochizuki. The final credits role as the Dragon King is swallowed by acid and fog. Speaking personally, The Living Skeleton is my favorite Shochiku film of the 1967-1968 period. 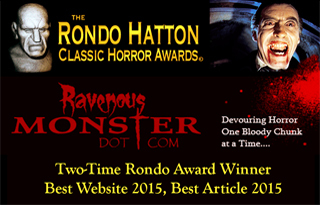 Although Goke, Body Snatcher from Hell is great and The X From Outer Space is delightfully corny, The Living Skeleton is both horrifying and familiar. While the other Shochiku films try a little too hard to encompass several genres at once, The Living Skeleton is classic J-horror in the same vein as Kuroneko and Onibaba. However, unlike those intentionally artistic pictures, The Living Skeleton is sleazy and made of pulp. It represents the best of Shochiku, a company that deserves more attention from horror freaks this side of the rising sun. These films are available from Eclipse in Eclipse Series 37: When Horror Came to Shochiku. Both of these films are also currently streaming on Hulu.